Ohno has been described as modest and seemingly shy, and he has overcome health challenges in his life that would have potentially ended any musician's career. Surviving both a serious car accident in which his teeth and lips were permanently damaged and a later bout of throat cancer which forced him to relearn his playing, with his efforts inspiring a biography and documentary in Japan about his life. 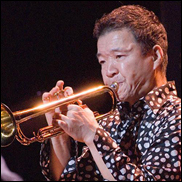 Ohno has performed with jazz legends Art Blakey & The Messengers, Herbie Hancock, Wayne Shorter, Gil Evans, Larry Coryell, Machito & His Afro-Cuban Orchestra, many other arts. With numerous recordings under his own name as a leader, he has also appeared on over 30 more as a sideman and has collaborated on two Grammy winning recordings.